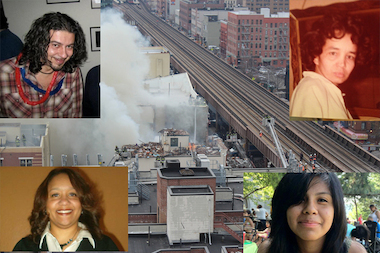 Clockwise from top left, Andreas Panagopoulos, 44, Carmen Tanco, 67, Rosaura Hernandez, 21, and Griselde Camacho were all killed in the East Harlem building explosion on Wednesday, March 12, 2014. MANHATTAN — Officials released the names of eight people who died in the explosion that leveled two East Harlem buildings as rescuers continued to comb through the rubble Friday morning. All were found in the rubble of 1644 and 1646 Park Ave. — two buildings containing apartments, the Spanish Christian Church and a piano shop — which suddenly exploded Wednesday morning. ► Mayumi Nakamura, 34 — Nakamura, a Japanese citizen, was pulled from the blast site Thursday night. She was identified Monday. ► Rosaura Barrios, 44 — Barrios' son was in critical condition and her cook daughter, also named Rosaura, was killed in the blast. ► Rosaura Hernandez-Barrios, 21 — The daughter of Barrios, Hernandez-Barrios excelled as a talented cook at Midtown's Triomphe Restaurant and was looking to build her career in the food service industry. ► Griselde Camacho, 44 — Camacho was as a police officer for 12 years in her native Puerto Rico before moving to New York. She was working as a decorated public safety officer at CUNY. Her mother, who was with her Wednesday morning, was injured in the blast. Camacho worshiped at Harlem's Bethel Gospel Assembly church, staff there said. ► Andreas Panagopoulos, 44 — Panagopoulos, a musician who worked in advertising, was sleeping at the time of the explosion. He was born in Greece and once played guitar for the band Evergreen. His wife, an editor at the newspaper El Diario, was on her way to work when the blast occurred. A fundraising page was set up to help her. ► Alexis "Jordy" Salas, 22 — Relatives had desperately searched four hospitals for him. He was sleeping at the time of the blast, relatives and reports said. He was a student and is survived by his pregnant wife, reports said. ► Carmen Tanco, 67 — Tanco was a dental assistant and lived at 1644 Park Ave., relatives said. She was part of the community at Spanish Christian Church, its pastor said. She also attended services at Harlem's Bethel Gospel Assembly church, staff there said.